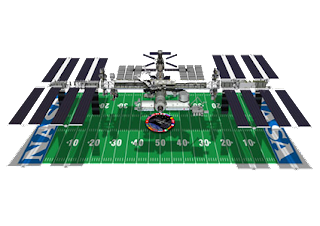 Fact 1 You all wonder that the size of ISS is same as size of football field. Take a look on image below. Fact 3 ISS has been visited 202 times individuals by astrologers. Fact 4 At the time of the 10th (Nov 2,2010) anniversary, the station’s odometer read more than 1.5 billion statute miles (the equivalent of eight round trips to the Sun), over the course of 57,361 orbits around the Earth. Fact 5 A total of 161 spacewalks have been conducted in support of space station assembly totaling more than 1,015 hours. Fact 7 The solar array wingspan (240 ft) is longer than that of a Boeing 777 200/300 model, which is 212 ft. Fact 8 Fifty-two computers will control the systems on the ISS.